Third day in the books here in Canton. The SUMC team rose early to start the day. After breakfast and a morning devotional from Mike and Matt Lauer, the teams all headed to their worksites. 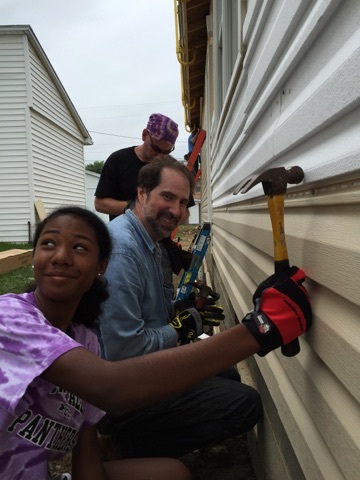 Two teams worked on siding, while one went to hang drywall. Our fourth team went to go work at the Habitat Restore warehouse. One of the teams going to work on siding drove about thirty five minutes to get to the worksite. This took us into Tuscarawas county, as the Habitat program we are working with has expanded from two counties to four. This gave the SUMC team an opportunity to serve in a county we had never worked at before. The job was for us to hang insulated siding, which required tacking up styrofoam before hanging the sheets of siding. Many of the pieces needed to be precisely cut to fit with the doors, windows, or lights on the outside of the house. The job kept our hammers, tape measures, and utility knives busy all day, with the occasional precision of a table saw needed. What started out as a breezy, cloudy day quickly turned into a hot, sunny one. We once again avoided the expected rainstorm, although just barely, as the heavens opened up heavily on the ride back to camp. 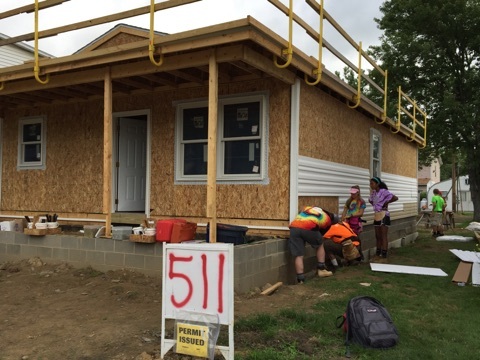 We were able to work with “OC” today, the Habitat worksite coordinator who many members of the SUMC team have worked with on several previous trips to Canton. The walls at the house had been pre-built by a local church who had written many different Bible verses and words of encouragement to the homeowners. The team was inspired by walking through the house and reading them, and they even added some words of their own. The second siding crew worked on a site a little closer to camp. Their job required much of the same work as the first site, with the same goal of hanging siding around the outside of the house. 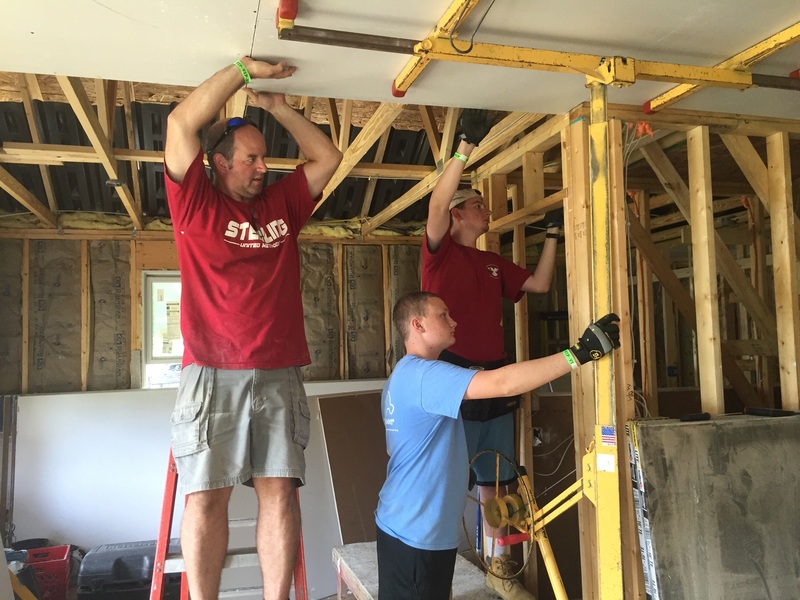 The team was excited to work with Dan and Cory, two Habitat workers that team members have met on previous mission trips here. They also got to work with Bob, a new intern at Habitat, as well as Claire, Habitat’s new community publicist. They shared devotional time with the Habitat workers. They also lucked out as the weather stayed dry in their area as well. The SUMC crew is excited to continue working on this house throughout the rest of the week. The drywall crew worked a long, full day hanging drywall inside the house, as well as even hanging some siding outside. The heavy load was the drywall inside however. Lots of measuring, cutting, and screwing left us with some slightly dusty but satisfied workers. The team was able to meet with Jim, a future homeowner through Habitat. His inspiring story was that he and his wife Barbara had lost their home after accidentally starting a fire while trying to thaw their pipes. The fire caused them to lose everything, including their pets. Habitat requires future homeowners to work hours (500 hours for a couple and 250 hours for a single future homeowner) on both their own houses as well as other projects in the community. Jim had worked on the house for eight hours today, after working the night shift for his work last night. His positive attitude and happy outlook uplifted the team. The team at the Habitat Restore warehouse had their work cut out for them today, but proved that the work was no match for them working together. They had to dust every piece of furniture and glass surface in the entire warehouse, no small job as the warehouse is the size of several football fields. The word warehouse does not do justice to the size of this place. The team’s work once again proved that even the youngest and smallest members of the team are eager to serve, and are making a big impact in His name. After finishing the morning with sweeping up the entire warehouse (again, keep in mind size) the team joined the drywall team for lunch. After another relaxing evening (that included much less running around and much more napping than Monday evening) the team had a wonderful dinner again. Margie Lazo greatly impressed the team with her pork chops, and under Mike Dinsmore’s direction the meal team once again did wonders. We gathered around the fire, sang songs of worship and all shared “God moments” we had encountered throughout the day. We finished the day with a devotional from Jess Bridgeman and Laura Pax, as well as agape from our prayer partners. Keep the prayers coming as we continue trying to be Christ’s hands and feet to the world around us. Love y’all and God bless.